What do Jane Fonda, Kristin Scott Thomas, Jodie Foster, Charlotte Gainsborough and Kevin Kline have in common? They all have been successful in English speaking cinema and you have probably seen them, but have also performed in foreign films. Why? Well, first it expands their opportunities. You might think opportunities to make more money and I am sure that is true, but I would add more artistic opportunities. Language is a skill and needs to be used in order to be maintained. Although most consumers may be locked into their primary language, movie stars get to travel. Many English movies are premiered in international film festivals. At the same time many foreign films are on display at American and British film festivals meaning movie personnel mingle. Often a decision to act in a film depends on the director and they are always looking for the ideal cast, while the actors are looking for challenges that add to their resume. Jane Fonda married a Frenchman, film director Roger Vadim. She appeared in "Tout va Bien" in 1972 with Yves Montand and directed by Jean-Luc Godard. More recently was in "All Together" in 2011. Kristin Scott Thomas, also married a French man, an obstetrician and has been fairly prolific in French cinema, while also being active in English films. I remember her in the comedy, "The Valet" (released in 2006 and directed by Francis Veber) where she played the smart wife with a two timing husband. "Tell No One," released in 2006 and directed by Guillame Canet, was based on an American novel, but the French were the first to pick it up and gave Kristin a significant role. Another supporting role was in "In the House," released in 2012 and directed by Francois Ozon. She was the lead for "I"ve Loved you So Long," released in 2008 and directed by Philippe Claudel. A film that went international was "Sarah's Key," released in 2010 and directed by Gilles Paquet-Brenner where she played an investigative journalist who was an American married to a Frenchman. We tend to think of the Holocaust as a German history, but this movie showed that the French were involved and wanted to forget their part. Jodie Foster graduated from Le Lycée Francais as class valedictorian in 1980. In addition to French she learned Spanish and Italian at an early age. She spoke French in "Stop Calling Me Baby" in 1977 directed by Eric Le Hung. She had a role in "A Very Long Engagement" that starred Audrey Tautou. Charlotte Gainsbourg was the daughter of Jane Birkin and famous French rock star Serge Gainsbourg. She got my attention in a comedic role in "Prete-moi ta main," released in 2006, and directed by Eric Lartigau. I was surprised to see her in an Australian movie, "The Tree" Recently saw her in "3 Hearts" released in 2006. She is in a movie I look forward to seeing with Omar Sy, in "Samba." released recently but not yet seen by me. 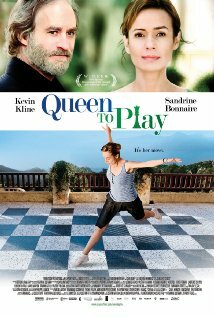 Kevin Kline is reported to be fluent in French (according to IMDB), but spoke only one sentence at a time in "Queen to Play"released in 2009, directed by Caroline Bottaro and set in Corsica. He also appeared in Swiss short, "L'homme du Pont Levant" with French dialogue, released in 2010 and directed by Claudio Todeschini. Pierce Brosnan is an interesting case. He appeared in "All you Need is Love", but only spoke English although the film shifted from Denmark to Italy. In a sense an arrogant rich American who didn't have to speak to the natives. For him he got to work with Danish award winning director, Susanne Bier and top actress Trine Dryholm. There are a lot of multi lingual directors, producers, composers,etc. etc. I am sure there are other English speakers who have performed in foreign language films. Some are major stars,but many are supporting actors. If I left out your favorite let me know. A Tabu everyone should enjoy!